Call 020 3746 1366 or fill up the online contact form, and our 24/7 customer assistants will give you a non-binding and free quote, and discount information. We have very experienced roof cleaners who can bring your roof back to pristine condition in no time. They make use of highly effective jet washing equipment and also telescopic poles which can get rid of lichen, mildew, algae, icky discolorations and moss from any roof. This will make your residence look much better, and will keep it safe from destruction from all the potentially dangerous growths on it. You may save lot of money for repairs, by choosing our service. We will ensure that your roofing is nice and cleaned up and we will do it at a very fair price. If you need help with the cleaning of your gutters, your roof or your outside windows, do not hesitate to make an appointment for our top quality cleaning services today! As we have actually informed you, Ashlee House Cleaning uses 100% safe procedure for all residential and commercial window cleaning orders we receive. The enthusiastic window cleaners Wallington SM5 use purified water. The nature of water in this demineralised state is to strive to return to its natural impure state by actively absorbing all dirt, chemicals and minerals it comes across. With continued use this system actually sterilizes the whole window and frame removing all detergents and chemicals used previously. Window cleaning using the water fed pole method allows our technicians to reach up to the 4th floor of the home. The pole is connected to a water supply in the van and is far faster to use than the conventional ladder method. 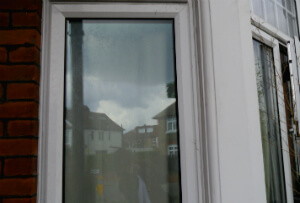 Right after the whole window has been cleaned the pole is lifted away from the surface of the glass, and more water is sprayed onto the window to give it a last wash. The window is left to dry naturally and because the water is completely pure there are no mineral deposits or other residues left over. Gutter cleaning is important if you want to keep your downpipes and gutters unclogged, and protect your home from water damage. Our expert gutter cleaners will use advanced equipment to ensure that everything is properly cleaned. A powerful dry or water vacuum cleaner is used. It has telescopic poles with tiny cameras, so that the cleaners can see any debris and remove it. Ashlee House Cleaning offers a 1-month quality guarantee. If your gutters get clogged within this period after of the cleaning, we will send a cleaning team to unclog and clean them again for free! Because we care about our clientele, we have tailored a very simplified and easy booking system for our window cleaning Wallington SM5 and for our other services. You could get a free price offer or book an appointment with our specialist window cleaners by simply just calling 020 3746 1366 or filling out the online booking request form. The customer support team is available 24/7. You will receive an e-mail and a SMS validating your reservation in 2 hours of your request. Choose every day of the year for scheduling us. We have fair rates. No advance payment is necessary for scheduling this service. If you are booking early on or are a regular customer, we will offer you our advantageous price for this particular and some other services. Estate agencies and property managers also get lower price offers. So why not leave it to our professional cleaners to successfully clean your windows, roof or gutters - get our top quality cleaning service right now!